This CD is a word-for-word retelling of some of the prophets' stories (see the list above). I chose the KJV translation, but it is also available in the NIV. I like that the re-telling is word-for-word. I don't have to worry about the speaker's interpretation, because there is no interpretation. The great thing about this CD is that the speaker adds such emotion and inflection to the reading that it helps make the story come alive. It truly is a one-man dramatization of the stories that we love. This is a great addition to our Bible study resources. A fellow blogger friend wrote a Christmas Cookbook E-book. It is on sale right now until December 24th for $2.50, free shipping. The book is sprinkled with holiday traditions from around the world and their corresponding recipes, like finding the lucky single almond in the Julgrot. You’ll find inspirational quotes, a section on making homemade ornaments from kitchen ingredients, suggested family traditions, snow day ideas, and a list of favorite Christmas books. And, of course, lots of love. 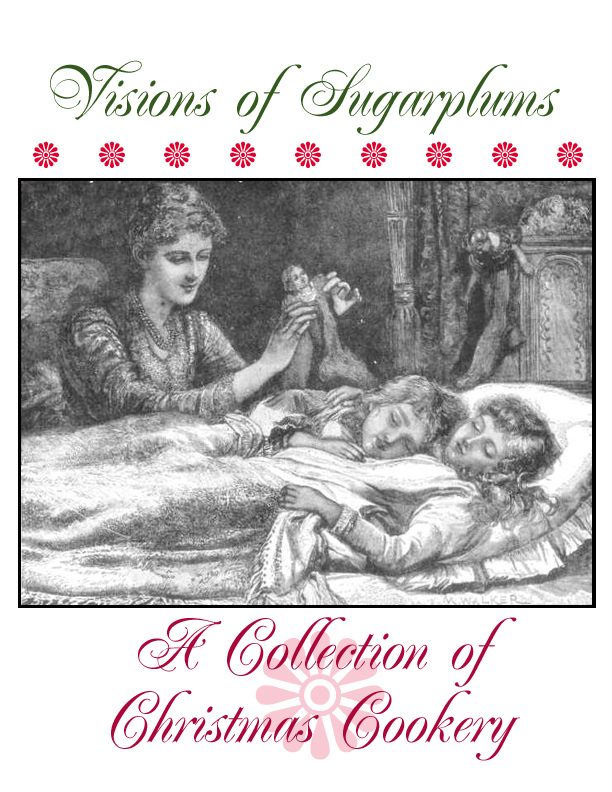 Visions of Sugarplums is thoughtfully arranged with vintage illustrations—a lovely keepsake for yourself or a special gift for a friend. Along with 3 other books in the series, 4 music CDs, a Cooper dog and backpack. These items could make great Christmas gifts. Get connected at Facebook and Twitter. 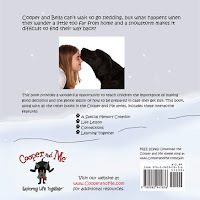 This is a delightful series about a black lab named Cooper, written by a young daughter and her mother. The books teach life lessons for young children, this particular book being about accidentally getting lost. At the end of the books you will find thought-provoking questions to discuss with your children. My 3 year old enjoys the books and likes the illustrations. 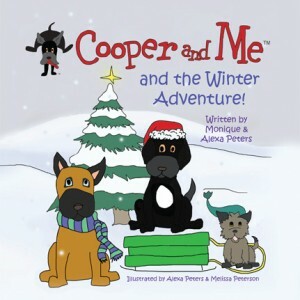 Cooper and Bella can’t wait to go sledding, but what happens when they wander a little too far from home and a snowstorm makes it difficult to find their way back??? In fond memory of Marc Lustgarten and to honor him, $1 of every Winter Adventure book sold at events and at on our website through February 2012, will be donated to the Lustgarten Foundation www.lustgarten.org/. One winner will be selected at random on Dec. 19th. 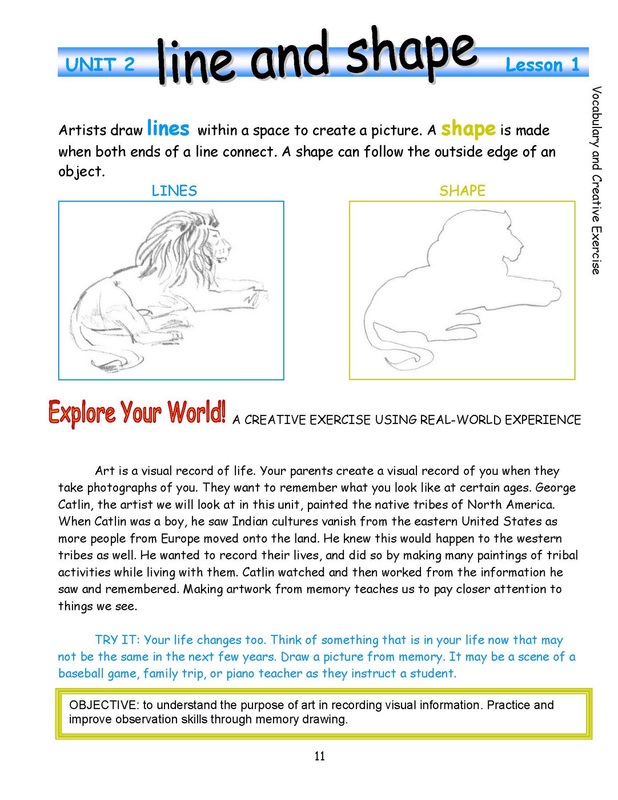 This book gives students their first in-depth look at the elements of art in a simply written text with illustrations in pencil, marker, and scratch art, the media they will be using. 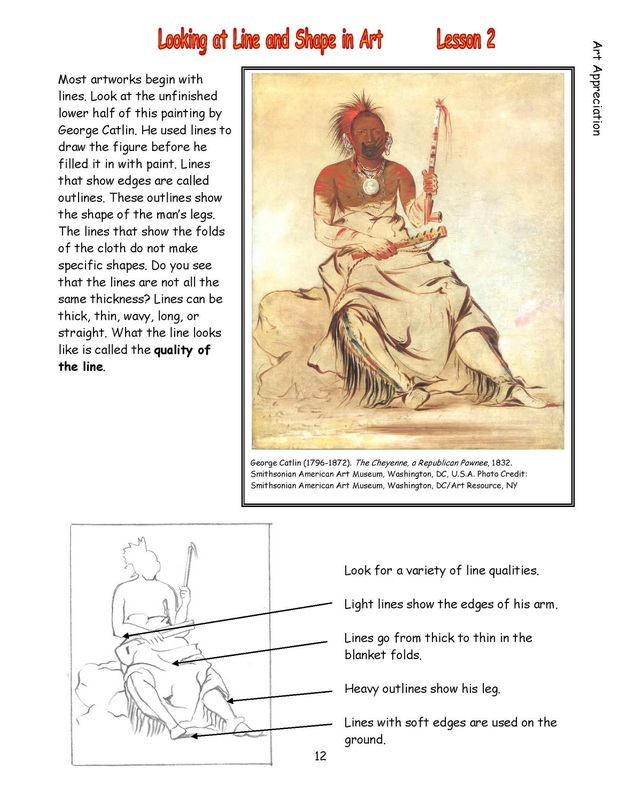 The elements of art and composition are explored through American art. Sample pages and review comments. We have made different attempts at different art programs over the years. None with much success. Most of the time we just end up winging it. And I end up wishing we had done more. So when this program came up for review, I was very happy to be selected. I looked it over and was happy to realize that we really could do this. This program could work for us. The book is made up of short, manageable lessons that a child could do own his own. But we decided to do it together. I get to learn the tips of the trade, while my 9 and 13 year olds draw the assignments, and my 3 year old does her own drawings with crayons and stickers. I was pleasantly surprised by how much my daughters liked it. They picked their own subjects to draw, based on the lesson requirements, and they took their time with the drawings. I learned a very important lesson from the author. She suggested that you always make to leave plenty of time for your child to finish the drawing. At least an hour. That a child rarely returns to the drawing with the same gusto the next time, once interrupted. I am thrilled to say that my children take longer than I expected, meaning that they are taking their time and taking the assignment seriously. 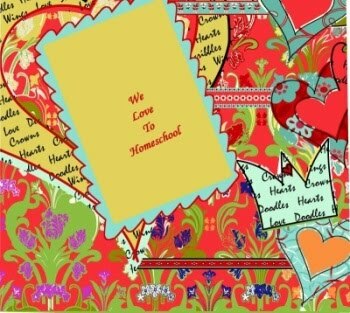 They enjoy the lessons; they don't complain about art time; and they actually ask to do art. They are learning important lessons and skills and even tips. I have already seen improvement in just a few weeks. A plus is that the book references famous artists and their paintings. She provides examples for students to study. So we get some American art history thrown in as a bonus. 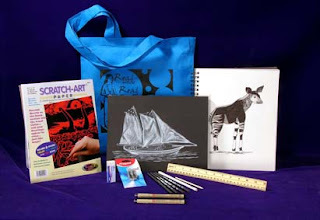 But when it comes time to draw, she lets the child pick an item, within a wide guideline, that interests the child. Children are much more eager to draw an item that they find interesting, versus the proverbial bowl of fruit. Final thoughts: I love this program. My children enjoy it. It is a winner here and I plan to keep using this book and then buy the next one in the series. 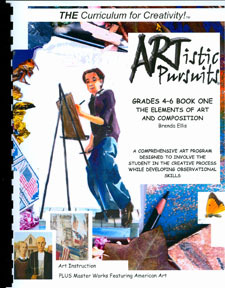 You can read about their philosophy and how they teach art. Le Français Facile! Level I was designed to be great for a family with multiple children of different ages. If you have mostly younger children though, you may want to consider the new Junior level which is targeted specifically at K-3 grade levels. It contains 34 all new lessons written to a younger audience. The character illustrations have even been redrawn as younger versions of the Level I characters (Cherie is VERY cute as a young kitten). There is more focus on the stories and songs (more new songs have been incorporated), and less focus on gramar and writing - perfect for younger children. As a member of the crew, I was given a choice of French or Spanish. Living in upstate New York, close to the Canadian border, I chose French. 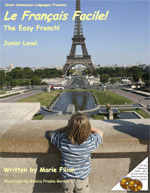 French Jr level. It comes with a manual and 2 CDs. The CDs have all the lessons on them, so that you may listen to the stories and hear the correct pronunciation of the words ( a big help ). CD1 is an enhanced CD, which you can load on your computer to print out the coloring sheets and activities. Jr. Level is geared to grades K-3rd. The stories are cutesy. The coloring sheets are simple. Games and songs are included with the younger set in mind. This younger version's goal is to focus mainly on the stories and the songs. It is to get the younger ones used to hearing the language, to gain an appreciate for the beauty of it. It incorporates different learning styles. With the audio of stories and songs. 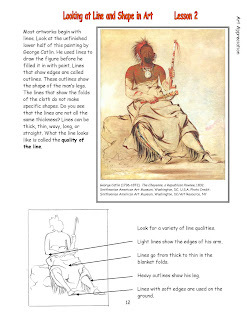 Following along visually in the book. 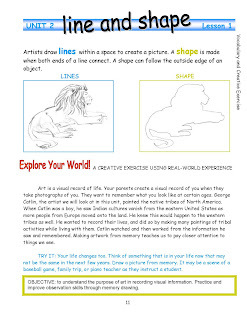 Hands-on learning with the worksheets and coloring pages. Instructions of how to play some French games for the active learners. We had a rocky start. But that was my fault for trying to jump right into it with my girls, instead of taking the time to look over the book, website, and CD to get a better feel for the program before beginning. I have since done all of those things, and understand the plan better now. It is designed for multi-ages and the manual stresses that the "program works for you", not the other way around. So make the best of it; do what works for your family. My 2yo will listen to the story and color the cute little coloring sheets of kittens and little girls, etc. My older children listen to the stories and then to the vocabulary (repeating the pronunciation and meaning after the teacher). They used some of the worksheets. My oldest daughter decided to keep a notebook, writing down the words and their meanings, along with a phonics-reminder of pronunciation. I haven't made a final decision about the program yet, but plan to keep using it and see how it goes. I have hopes that my children will get more excited about it as they learn more words and enjoy using them on their own in everyday conversation. I do already know that I love the company and what it stands for. The company is called Great Commission Languages for a reason. Find out more here. Disclaimer: I received this curriculum free of charge to review, as part of the TOS Homeschool Crew. The above is just my opinion. Please remember that opinions may, and do, vary.